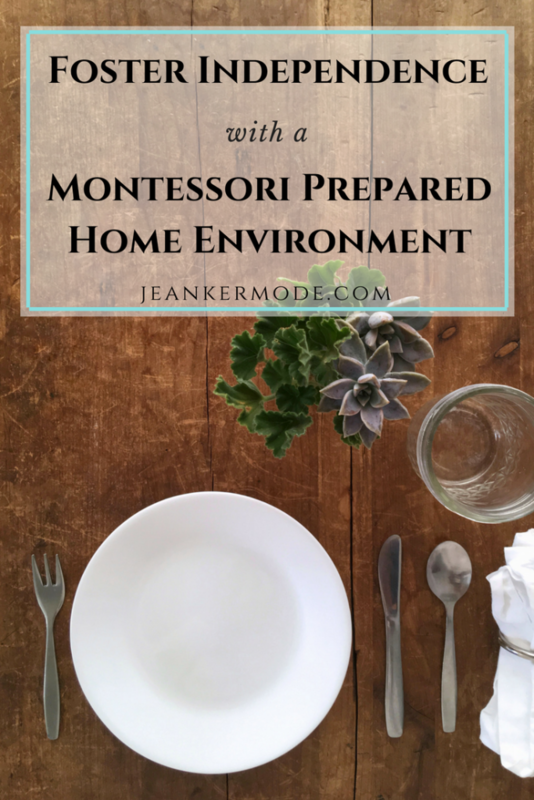 Here are four simple steps to help you set up a Montessori prepared environment at home and on a budget. Using mostly items you already have, create a home environment that will help your child grow in independence, and save you a little sanity. It’s all about the prepared environment, guys. We know how important our own environment is. TV’s on, can’t focus. Desk is a mess, my thoughts are a mess. Ugly environment, no inspiration. Can’t find anything, can’t get anything done. It’s the same for kids, especially for children under the age of 6. In a quiet environment, they can find concentration. In a beautiful place, they are happy to work. In an orderly space, tailored to their needs, they develop habits and routines and independence. That last word is the most important. The independence of the child is the final goal of the prepared environment. Even if a room is organized and attractive, it is lacking if the child can’t reach anything. The child needs access to purposeful activities in an environment suited to her basic physical, psychological, and spiritual needs. Sounds beautiful. How exactly do I set that up? 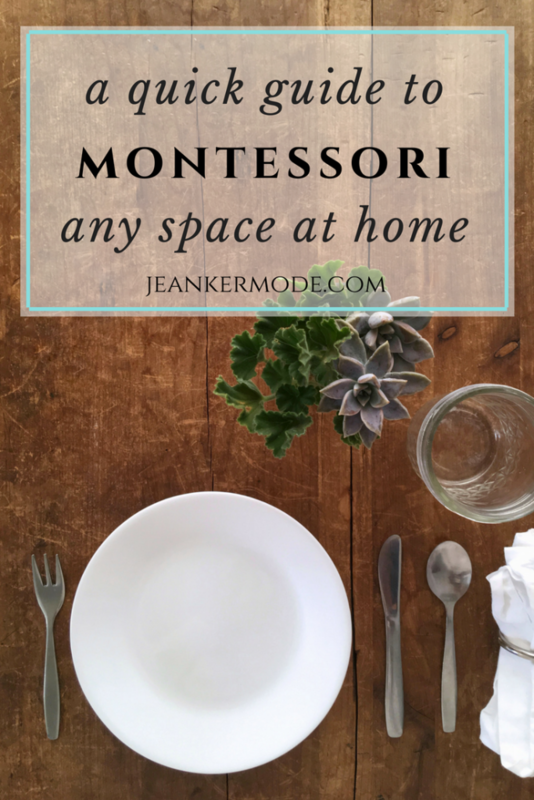 There most likely won’t be just one space that you want to “Montessori.” Your kids are busy all over the house, and that’s good. In my training, I learned that children should not be the center of the family, they should be part of the family. Which means they should have access to most of the areas of the house where the family lives and works. But to start, just choose one space. Before you dive in, spend a few days with your child in that space. If you’ve chosen the bathroom, pay attention to what your child needs in the bathroom. What does he ask for help with, and what could he do himself? Could he brush his own teeth if he was able to reach the toothbrush and toothpaste, and if you showed him how? Now that you’ve observed your child’s needs in this space, make your plan. 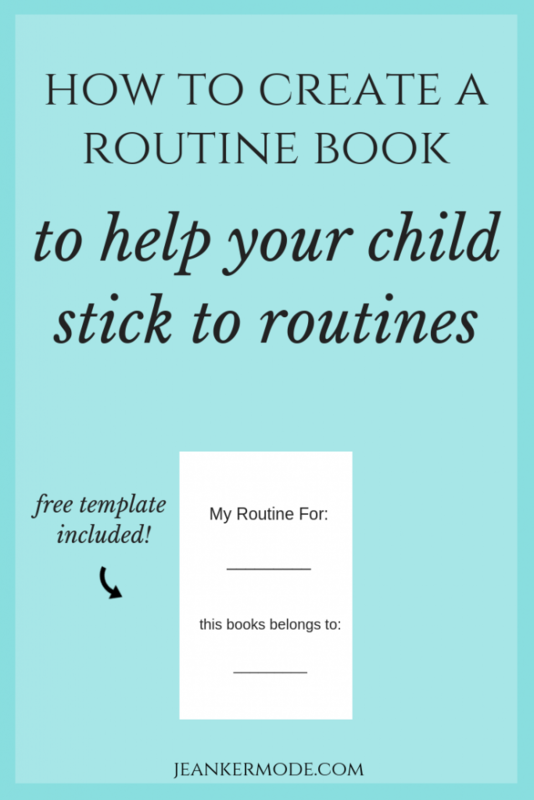 Consider your family routines, or the routines you’d like to set in place. For example, every evening, Charlie needs to use the bathroom, wash his hands, brush his teeth, and wash his feet if he’s been playing outside. That’s the routine. So you need to plan the environment around that routine. Charlie can use the bathroom and wash his hands without help, but it would be good too if he was able to replace the toilet paper when the roll runs empty. Is there a place you can store a few extra toilet paper rolls in the bathroom, maybe in a lower cabinet? Charlie knows how to brush his teeth, but so far you’ve been helping him apply the toothpaste. Can you show him the right amount, and store everything in a drawer within his reach? Using the tub independently is a little much for Charlie. Do you have a shallow plastic bin for him to wash his feet in instead? He could fill it using a pitcher and water from the sink, and it could be stored in the bathtub or under the sink. And if he has his own towel, he’ll know not to dry his feet on the hand towel. It might be a good idea to store a few rags within reach as well, so he can dry up any spills. You probably have most of the items you’ll need, but it might help to make a list and check things off as you gather them. Of course this is just a sample list, but you can see that you need very little to prepare an environment at home. 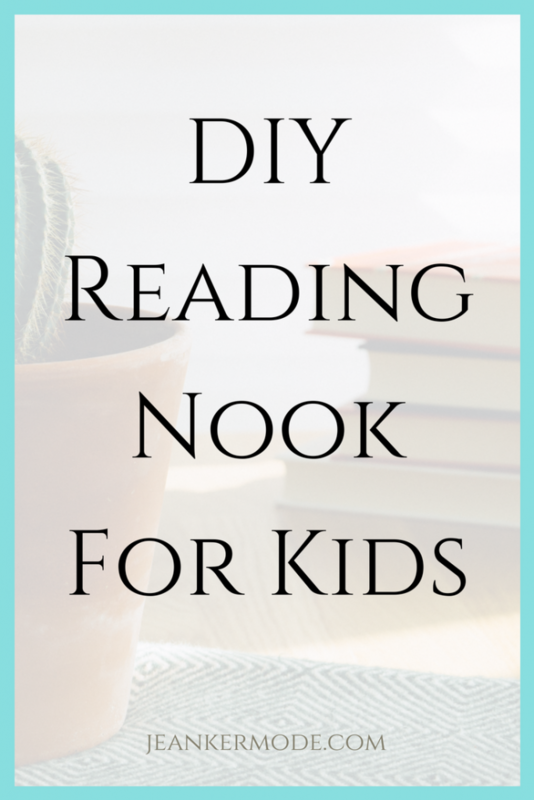 Set up the space, and when it is ready, show your child how to use everything. This can be done in an inviting and appealing way. Kids like to know what is expected of them, and might even find it exciting that they get to wash their feet in their own special bin, and do it all by themselves. 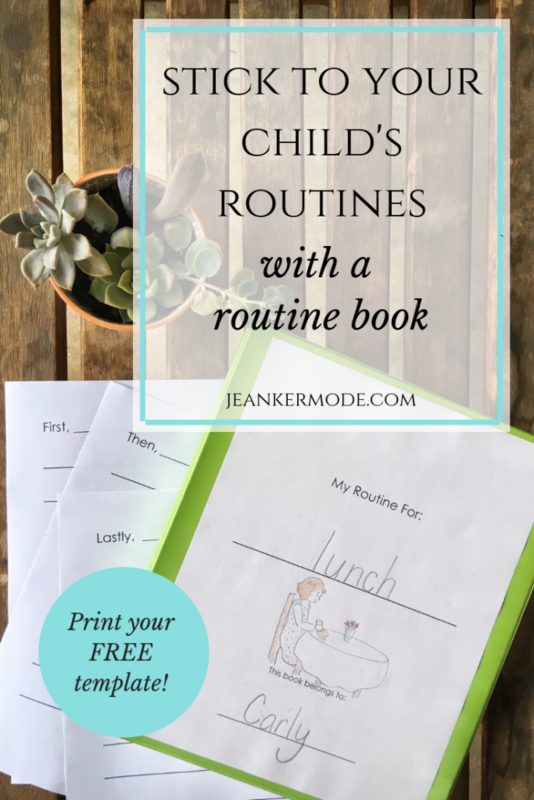 You can show your child the routine as the need arises. For example, on the first evening after you set up the environment, show Charlie how to fill up the bucket with water using the pitcher. Use more actions than words, but do explain when he needs to wash his feet. (e.g. only if they’re dirty.) You can have him watch you fill up the bucket, wash your own feet, rinse out the bucket, dry it, and store it. Then you can invite him to do it himself. *Note: For potentially fun activities such as washing feet, you might want to set a time limit. You can include a 3 minute timer if you think it would help. There you go! With observation, a little planning, a few materials and routines, you can create a Montessori prepared environment at home and help your child grow in independence. 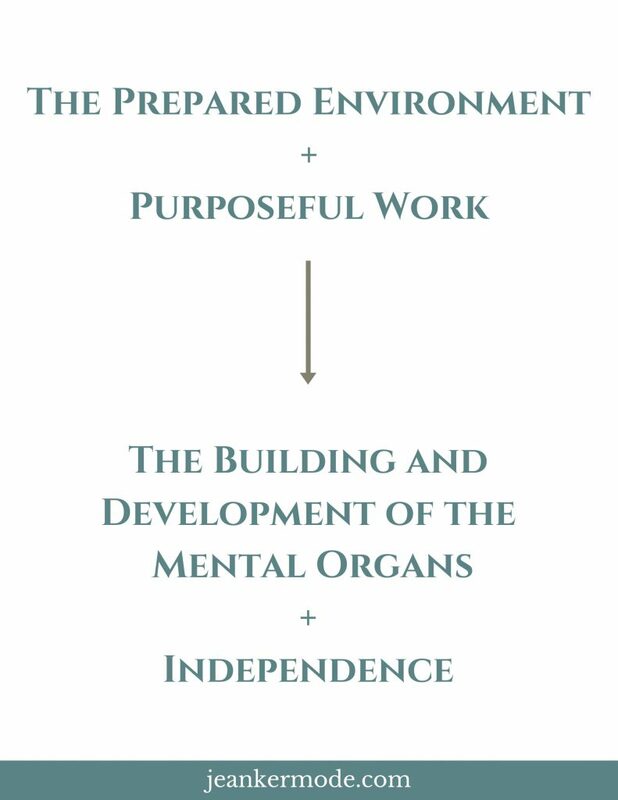 How do you create an environment that fosters independence? Share your tips with us in the comments! 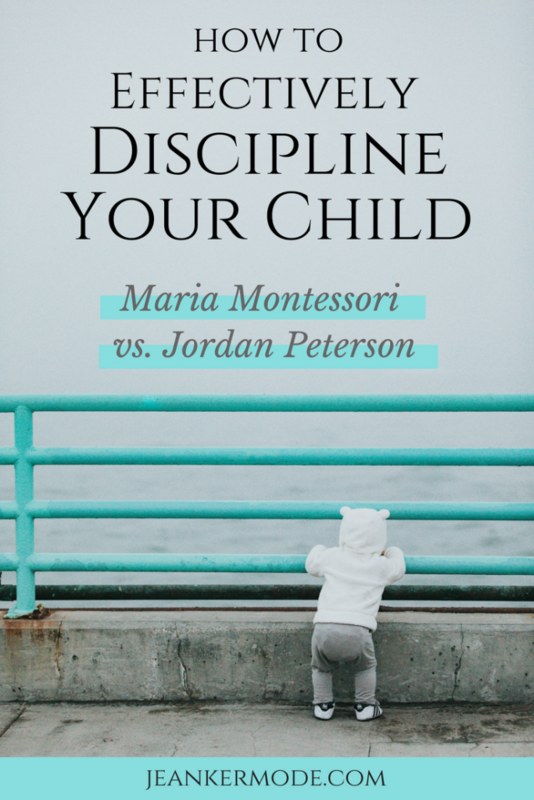 At first glance Peterson’s advice on discipline seems very different from what we know about Montessori discipline. But is it? Join me as I dive into each expert’s writing on the goal of discipline, the use of punishments, and tactics for effective discipline. ‘Obsessed’ might be the word to describe my level of interest in human development and the strategies related to its nurturing. Which is why I read Rule 5 of Jordan Peterson’s 12 Rules for Life: An Antidote to Chaos with great attention. It’s called, “Don’t Let Your Children Do Anything That Makes You Dislike Them,” (unexpected title) and it’s all about the discipline of children. I overanalyzed it as I read, looking for clues. Does Jordan Peterson agree with Maria Montessori on discipline? Do his ideas add to or change my understanding of human development? That unexpected chapter title gives away what Peterson says is the goal of discipline: social well-being. “Poorly socialized children have terrible lives.” They need to be liked. Sounds shallow, but he has a point. We’re social creatures, and we can’t be happy if we’re not part of a community. People who are disliked are often rejected by the community. So it’s harder for them to be happy. Socialization. That’s the goal, before wonder and independence, because it leads to them. And good behavior, learned through discipline, is the key. There are more, but these two help us understand how Peterson believes parents should discipline their children. Establish rules, and enforce them. Peterson proposes interesting tactics for rule enforcement. 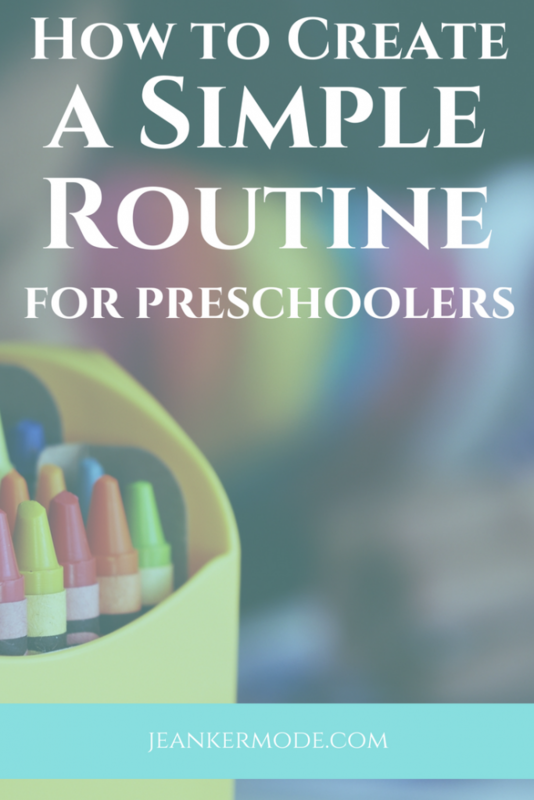 Teach good behavior with simple steps. Generally, I’d say Maria Montessori agrees with Jordan Peterson. Discipline is essential, and it needs to happen early. There are some areas of disagreement; closer inspection will show us where. Peterson believes socialization is more important than independence, but that it helps foster individuality. Montessori believes independence is pretty darn important, so that the child can fulfill his role as part of the community. Seems to me they both agree that the end goal of child-rearing is a whole human being who thrives in a community. Peterson says, “Limit the rules.” Montessori says, “A child needs freedom within limits.” Here the ideas are compatible. Montessori uses the word ‘limit’ instead of ‘rule’ to help the adults understand how to set these limits/rules. They are not arbitrary, but help the child use her freedom well. The combination of thoughtfully set limits and freedom gives us rules, but not too many. Peterson says, “Use the minimum necessary force.” Montessori says, “Sweetness, severity, medicine, do not help if the child is mentally hungry.” Here the ideas differ. Montessori believes freely chosen, purposeful activity, within limits, in a good environment, is the cure to character problems in young children. Thus, she definitely disagrees with Peterson’s use of arbitrary punishment, e.g. pinching. Montessori discipline does, however, make use of logical consequences, implemented firmly and consistently by the adult. A logical consequence to poor behavior, e.g. being removed from the playground, could be what Peterson means when he says minimum necessary force, if it is enough to discipline the child. He clearly doesn’t believe a logical consequence is always enough. Peterson writes about teaching a child to set the table, by first showing him how to hold and carry a plate. (#somontessori) The style may differ slightly, but the idea is the very same. As I mentioned above, there are Montessori lessons on all types of good behavior, from apologizing to blowing one’s nose to closing the door quietly. 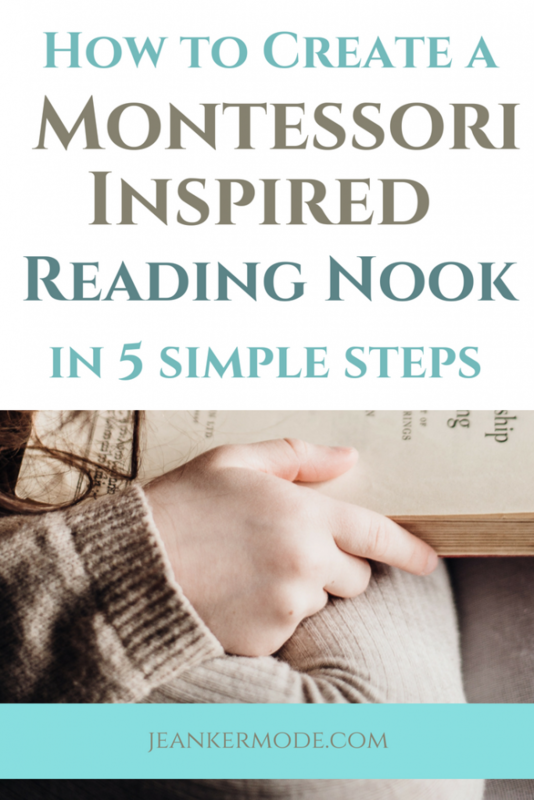 Likewise, every single Montessori lesson is given by modeling the right way, and breaking it down into simple steps. 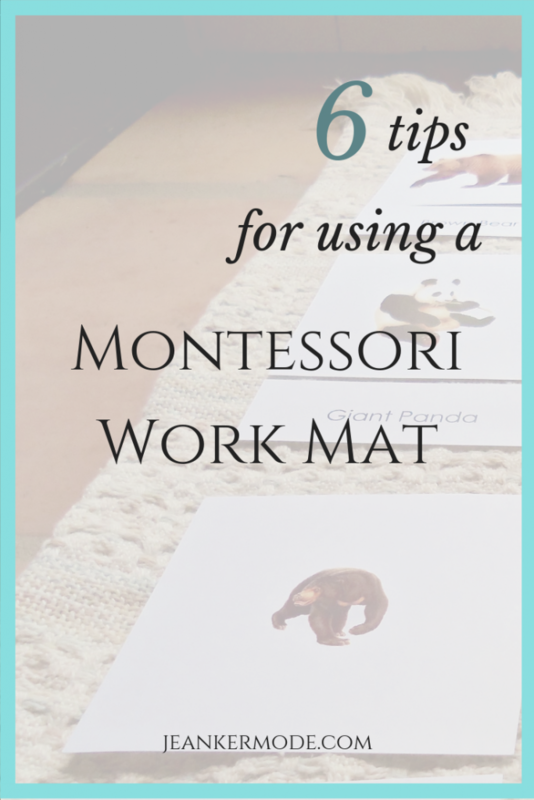 Montessori teachers don’t cut corners. We show every step, and then let the children give it a try. Now before you exit outa here because this is so not Montessori, let’s look at a few of Peterson’s examples of effective rewards and punishments. 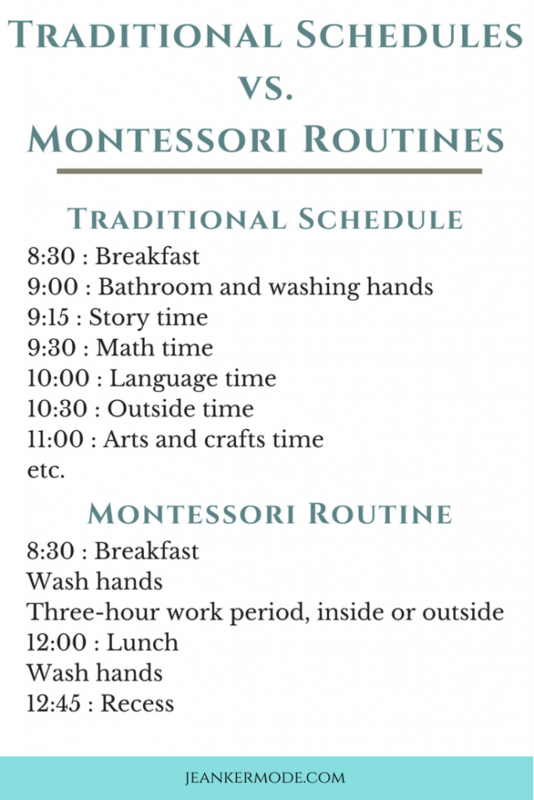 In practice, then, Montessori discipline and Peterson discipline might look very similar, but there is a difference. The Montessori method stresses the importance of treating children with respect (e.g. paying attention) regardless of their behavior. It is not a reward. Likewise, a time out is used as a consequence, as I mentioned above. When it comes to using negative emotions, Peterson isn’t being harsh. On the contrary, he is looking for a more merciful route. “The judgmental and uncaring broader social world will mete out conflict and punishment far greater than that which would have been delivered by an awake parent. You can discipline your child, or you can turn that responsibility over to the harsh, uncaring, judgemental world.” He knows the world is a difficult place, and that suffering is part of every human’s experience. Montessori recognizes this, too. In Montessori classrooms, teachers are kind, but they do not shelter children from the unpleasant realities of life. If someone breaks a material, that’s the end of that material, at least for a good while. There will be no immediate replacement, no matter how much everyone misses it. I think the biggest difference then is that Peterson advises parents to sometimes inflict negative emotions. The Montessori method permits them as a reality and as a consequence, but doesn’t advise directly causing them. 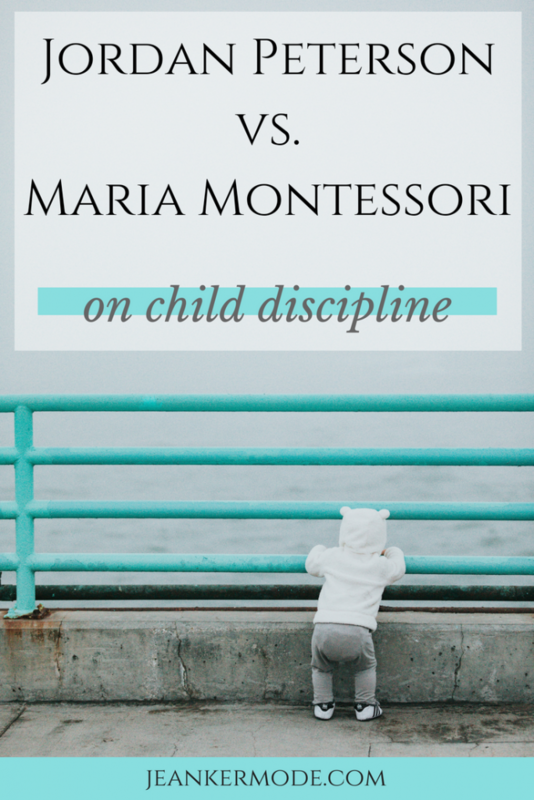 In my training on Montessori discipline, I learned to never engage in a battle of wills. In such a battle, someone has to lose. If I lost, the child would lose respect and trust for me, and would be less likely to obey me later. If the child lost, her own developing will would weaken. Since the will is a gift from God, is what makes us human, and is a necessary component of self-discipline, it’s worth protecting. Instead of battling, I learned to make the objective clear, in a firm, kind and confident voice, before the chance for a fight became possible. Then the child sees it is a good idea to obey, and chooses to do so or face the consequences. This tactic worked well for me, but I am sure there will be times when a battle seem inevitable. So be it, as a last resort. 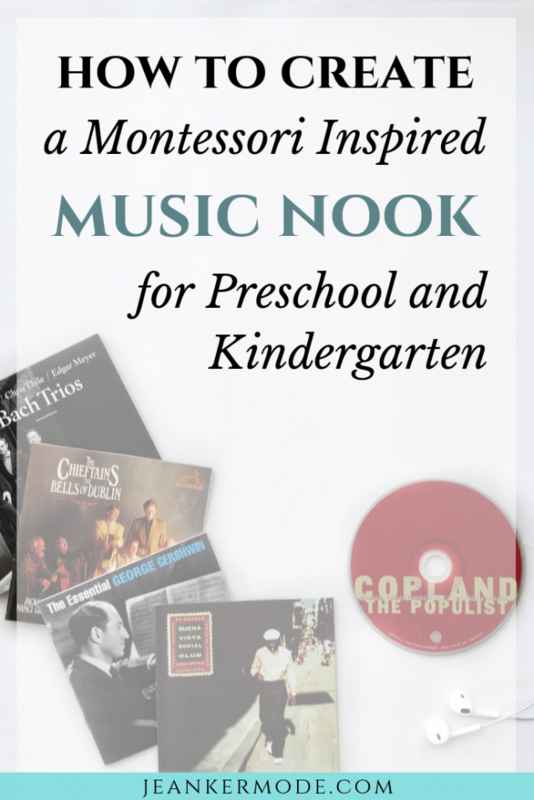 There is one more difference between Peterson and Montessori. Maria Montessori is very scientific and idealistic, for example, “If, at conception and during gestation, at birth and the period following birth, the child has been scientifically treated, he should at three be a model individual.” Nature is on our side, we just need to cooperate. These views shape their methods of discipline, and the tactics they propose. And now I want to know, what do you think? Which view/method makes more sense to you? Do you think they are all that different? Is it possible to use both? Let’s chat in the comments! 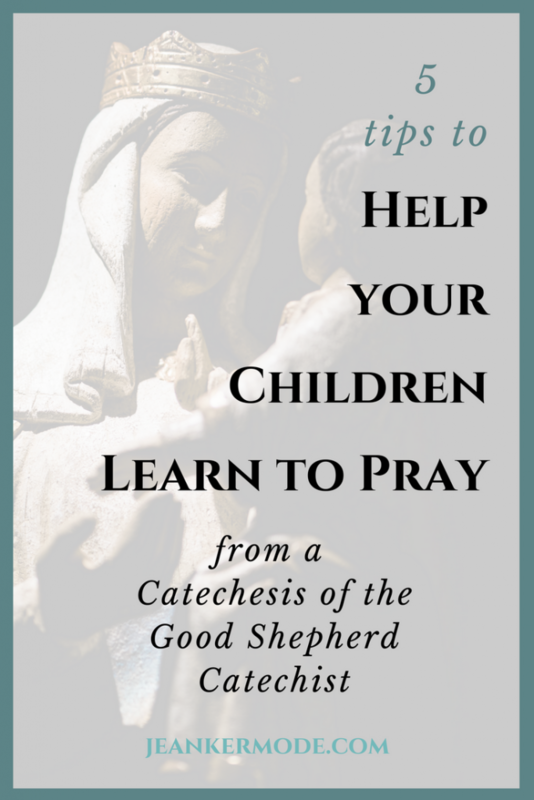 Help your 3-6 year-old child learn to pray with this two-part strategy, based on Montessori philosophy, and practiced in Catechesis of the Good Shepherd. Five practical tips are included to help you implement this strategy. The benefits are subtle, but lasting and beautiful. Sometimes little Jimmy folds his hands enthusiastically and cutely fumbles through the prayers. Other times, he refuses, preferring to roll around on the floor. None of this is surprising, but it can be exasperating, and humbling. 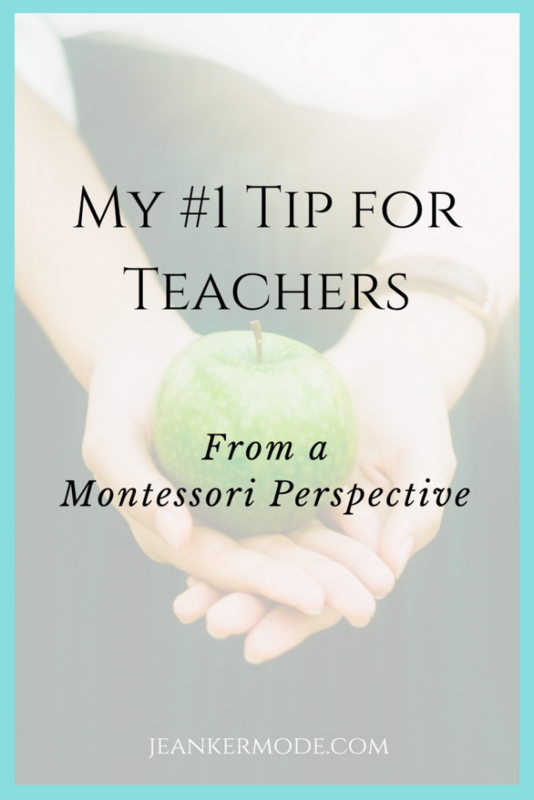 I like to believe that Montessori has an answer, tip, or perspective for everything. This one came in the form of a Catechesis of the Good Shepherd catechist. A group of 3, 4 and 5 year old children, of varying levels of cleanliness and calmness, sat around the catechist on the carpet. On the prayer table was a statue of Mary, the Bible, and a burning candle. The catechist told the children she wanted to show them something. She closed her eyes, then slowly, carefully, and beautifully, made the sign of the cross. Next, instead of saying cheerfully, “Ok let’s all try together on the count of three!” she told the children, “I’ll show you again.” And again she closed her eyes, and slowly, carefully, and beautifully made the sign of the cross. Now, not all of the children were exactly spellbound. Some looked around at their friends, grinning. One remained engrossed in her socks. But the sense of quiet reverence that permeated the room was present to the children and their spongy, absorbent minds. And this is where our strategy begins. Children, for the first 6 or so years of life, have an absorbent mind. What is absorbed forms the mind, e.g. the memory, will, etc. This means that if a child sees and hears people praying, she will absorb these sensations into her mind. And you don’t have to tell her to do it. It happens by nature. Let them see you pray. Let them hear you pray. Don’t make it a show. Make it real. Surround your children with prayer, and with a reverence towards the sacred. Allow them to absorb these sensations and attitudes to form their minds and stay with them forever. You probably saw this one coming. Kids are huge imitators, and we all know it. Ask any three-year-old what he wants to be, and he will tell you he wants to be “just like so and so.” He wants to imitate some great and wonderful older person. Children by nature are drawn towards the good and beautiful, and they are drawn to imitate it. We need to trust this instinct. Give them the freedom to imitate you praying. Your children, who love you and see you praying, will naturally imitate you. It’s wired into them. This step can’t stand alone. It must follow the first. If you’re kids don’t see prayer as good and beautiful and natural, they won’t want to imitate it. After you introduce a prayer or gesture, say it or do it slowly enough for the child to hear and see, but still naturally and reverently. Don’t wait for the child to join in, or fold his hands, or make the sign of the cross. Simply begin, and allow him to watch and then join when ready. Avoid praising the child when she says a prayer or completes a gesture. The focus is on God. You might be on the fence about this seemingly passive strategy toward forming good prayer habits. Prayer is important, do we really want to just let our kids join in when ready? Shouldn’t we nudge a little more? First of all, a note: the absorbent mind lasts until the age of 6. So this strategy will not work with your 6 and uppers. There is a time for laying down the law, e.g. “We fold our hands during prayer, and that means you, pal.” This time, however, comes when our kids are able to respond to reason, to pull themselves together, and to fold their hands. The beginnings of a habit of prayer that is based 0% on coercion and 100% on love/the desire to imitate what is good. The beginnings of a habit of listening to the promptings of the Holy Spirit. Those natural instincts that draw the child towards the good come from God. Our goal is to work with God, not instead of Him. Hopefully, a deeper prayer life in ourselves, once we realize how important it is to model the goal in a beautiful way. And a woman, beautiful on the inside and out, gave this testimony at her father’s funeral, which I attended. I’ve copied it here with her permission. “I was not a devout child, although I loved Jesus and Mary as most kids love the hero and heroine in their favorite story. My first memory of prayer is of our family gathering for night prayers and the Rosary. I recall stubbornly lying behind the couch, night after night, as my parents knelt before our image of Jesus and Mary and recited the decades of the Rosary. I would braid my rosary between my fingers, hang it around my neck, loop it around my wrists. It was just another plaything, the only one I was allowed during prayers. I kicked my legs in the air out of sheer boredom, invisible behind that couch. Then, one night, I remember standing up from behind the couch and really listening to the words for the first time, wondering why anyone would say the same thing that many times and what the words really meant. I knew “It’s a small world after all”, and I knew it drove my parents crazy if I sang it enough times in a row. Why would anyone say the ‘Hail Mary’ that many times with love and respect in their voices? Why was there a difference? It was a mystery I needed to unravel. If you’re interested in reading more about Catechesis of the Good Shepherd, the Montessori-based catechesis program, please visit here and here. Share your advice with us in the comments! 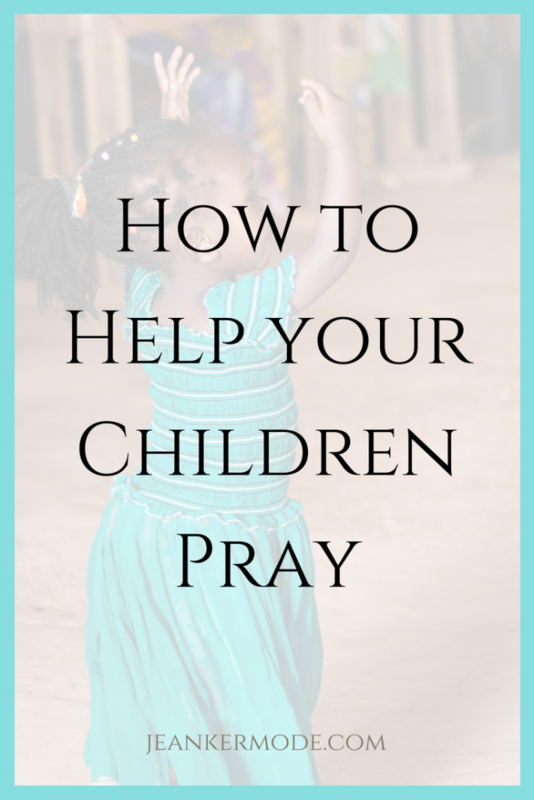 How do you encourage prayer in children? P.S. Check out the free, printable prayer cards in my resource library below. Catechesis of the Good Shepherd uses prayer cards like these throughout the liturgical year. They are set up on the prayer table and read aloud to guide reflection. Print yours today! 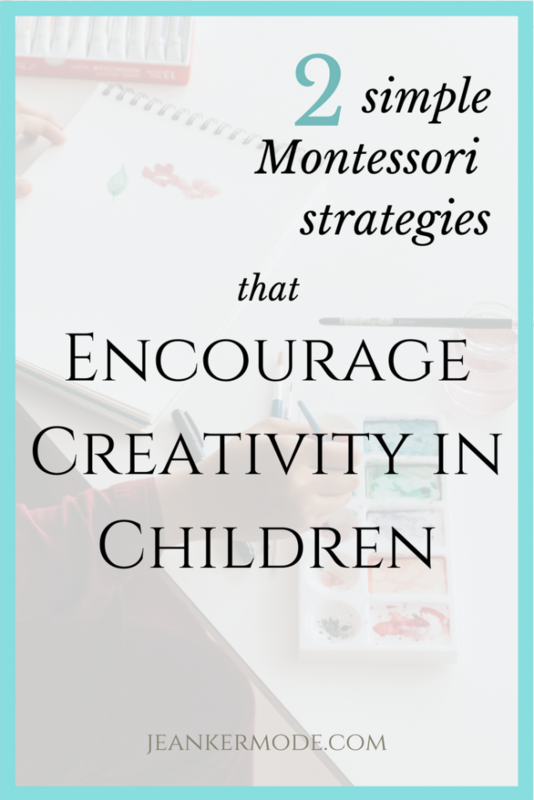 Instead of doing group crafts, find out how to encourage creativity in children with these two Montessori strategies. In case you were wondering, the Montessori method of education does not encourage crafts. At least, not the way we usually think of crafts. You won’t find children tracing hand-print turkeys in a Montessori classroom, nor participating in a group art project led by their teacher. You will find children painting, or making interesting things out of clay, or maybe even embroidering. 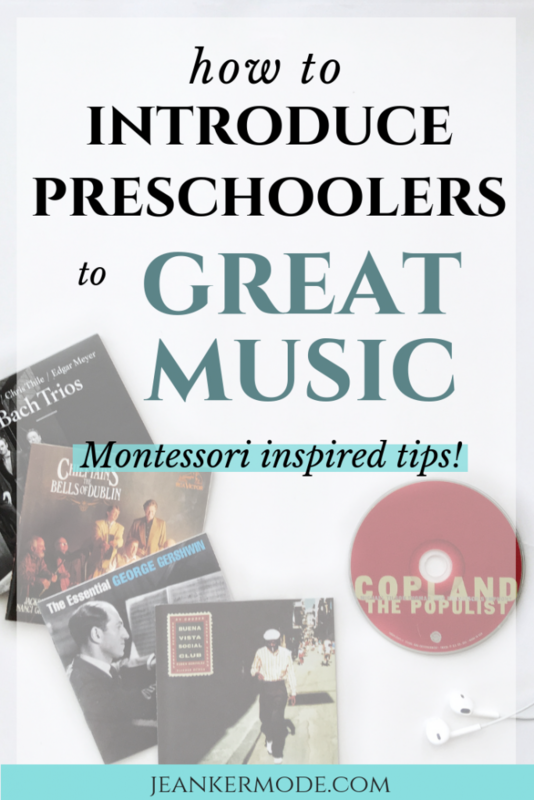 Although the Montessori method doesn’t encourage crafts, it does promote creativity. 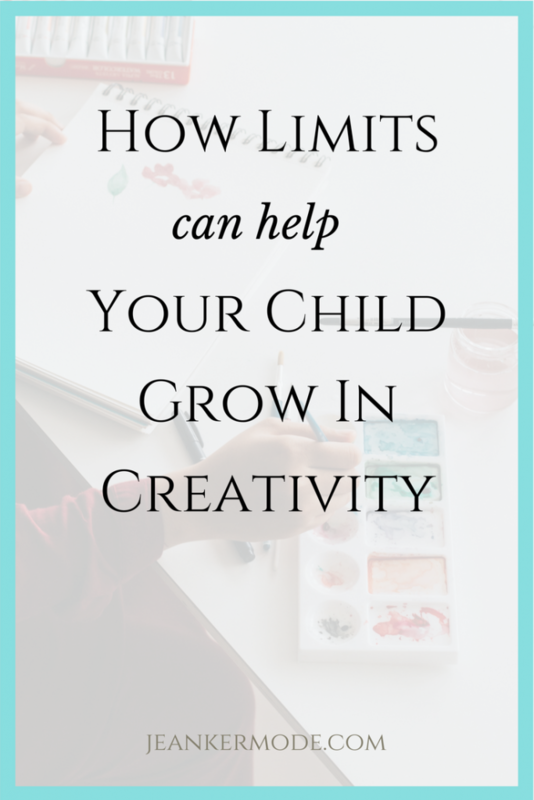 Here’s how you can nurture your children’s creativity without spending all your time cutting out paper feathers or trying to come up with a craft everyone can handle. I’ve written about how the process of creating is much more important for a child than the product he ends up with. This is why we don’t want to tell him, “today you will paint a bird, and this is how you will do it.” Instead, we want to give him the opportunity to build his mental powers through working with his hands and following his inner seed of development. So here’s the trick: give your students the tools to create art that is an expression of their own experiences and observations. For any artistic medium, there are basic techniques, or tools, the artist uses. Painters use different types of strokes, sculptors have different ways to shape their clay, etc. Teach these foundational skills, and then give the child freedom to use them. Painting: Start with an easel, paper, paint, brush, and jar of water. Tell the child you want to show her something. Have her watch you dip the brush in the paint, and make a few big, fluid strokes across the paper. Then make some bristly dabs with the brush. Just show her a few things at a time, and make sure she knows how to rinse the brush between paints. Then give her a fresh piece of paper, and let her paint. A few days later, you can show her some more techniques. Working with Clay: Start with a block of clay, a work mat, a damp towel, and one or two tools. Tell the child you want to show him something. Have him watch you kneed a piece of clay, then form it into a few different shapes, such as a coil, or a slab. Show him how to wipe his hands on the towel. Then let him work. Embroidering: Start with two embroidery hoops, two pieces of fabric, two needles, scissors, and embroidery thread. Tell the child you want to show her something. Have her watch you choose a color of thread and thread your needle. (This might need to be a separate lesson given previously.) Then show her one or two types of stitching, and you can tell her what each stitch is called. Show her what to do with her needle when she is done. Then let her choose her own color of thread, and stitch away on her own piece of fabric. You get the idea! 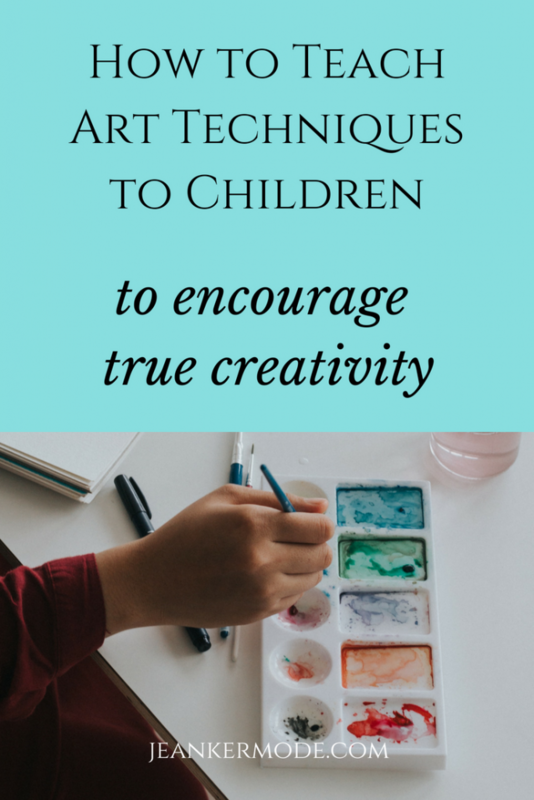 By giving your children these tools and techniques, you open to them a whole world of true creativity. You show them how to learn from others, and at the same time give them the freedom to create their own art, and develop their own will and personality. At first this may seem counter-intuitive. We just finished talking about freedom, baby. Wouldn’t that mean no limits? So, to balance the child’s need to develop his will by making his own choices, with the reality that he is still developing that will, we give him freedom inside of good limits. For example, when showing the child how to paint at an easel, you could start by giving him only one color of paint. When he seems mature enough to remember to rinse his brush, you can give him a second color, then later a third, and a fourth, and so on. You might also limit him to one painting per day. And fear not! Limits don’t hinder creativity, they can actually help it. Creative limitation is the concept that limits provide a challenge that encourages creativity in order to overcome that challenge. For example, this 6-word short story. Consider the strengths and tendencies of each child as an individual. One child may need tighter limits than another. Consider the classroom and family as a whole when setting limits. If one child can handle a wide limit, but this disrupts the other children, then it’s not the right limit. Limits are not punishments, though they might be consequences. Of course, creativity, like development, is never something we can force. We can’t make the child be creative, or make him want to be an artist. But we can give him the tools, and the freedom within limits, to nurture whatever talents God put inside him. Your turn. What strategies do you use to encourage creativity in children? Have you tried these two? Let me know in the comments. I can’t wait to read what you have to say, and I always get back to you. Of all the advice for teachers that is out there, this one is so important! 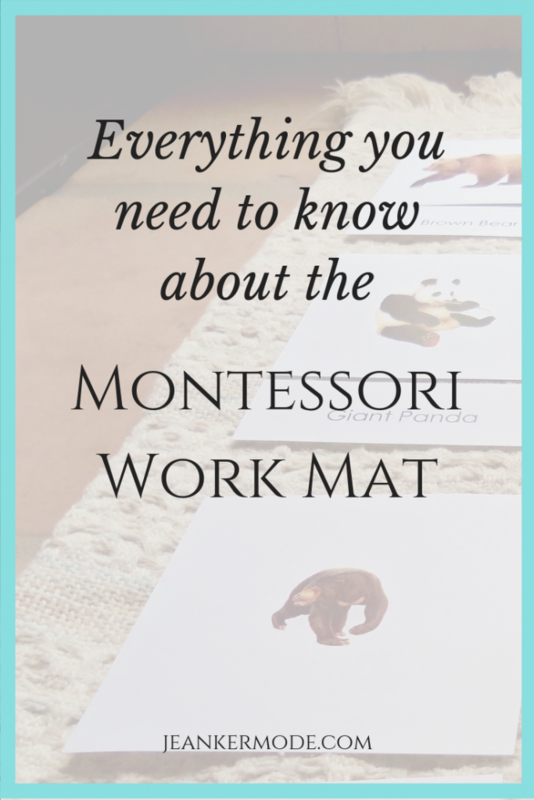 This Montessori based teaching strategy is basically the golden rule for Montessori teachers, and traditional teachers can benefit from it, too. Calling all teachers! And parents, tutors, nannies and anyone else who works with children of any age. You want your students to thrive. You want them to learn, grow, listen to what you have to give them, and work hard. This sounds like the advice we give our students all the time: concentrate! But the advice I want to give you is for teachers and those who help children learn. Never interrupt your student. Protect his concentration from other students. Protect it from himself and his own distractions. And protect his concentration from yourself and all your well-intentioned interruptions. We tell children, “concentrate!” all the time. Now we need to ask ourselves, are we helping them or hindering them? It’s simple, really, but it helps to dig in a little to think about why concentration is so important. As teachers, it’s easy to fall into a double standard without even realizing it: we reprimand our students for blurting out and interrupting the class, yet we interrupt them mid-sentence, or mid-focused-work, all the time. We tell ourselves that we have to keep the class going a certain way. And we really believe that it does them no good to continue uninterrupted if they’re making mistakes. Now that last thought starts a whole new discussion about correcting students, which we can save for later. But the point remains. Even if you do need to correct a student, do so with respect. And do everything possible to correct at a time that does not interrupt the child’s focus. Our goal for our students should be bigger than just passing the next test. The bigger purpose is to help them learn how to learn, so that they continue to learn, grow, and thrive for the rest of their lives. Concentration is vital. In our noisy, busy world, the ability to focus on a worthy task will make or break their pursuits. And they don’t need to pursue an academic future to put concentration to good use. Concentration is necessary for learning any new skill, whether an instrument, a sport, a trade, or a new language. The value of concentration extends even further! Have you ever tried to have a meaningful conversation with someone who is distracted and unfocused, who is checking her phone, glancing around, or spacing out? Concentration can help our children form more meaningful and intimate friendships. For Christians, and perhaps for other religious, concentration helps us form a true spiritual life. When the goal is communion with God, the friendship of all friendships, we have to learn how to concentrate. I realize that this is a highly controversial area of discussion. Many disagree on the cause of these disorders, on the best way to deal with them, and even on the legitimacy of labeling children with such disorders. I am not qualified to address these disagreements, but I do believe that children who exhibit difficulties with attention deserve even more respect and care regarding their concentration. If your student who has the hardest time focusing is finally focused even for a second, don’t interrupt him! Hold all your students and yourself to the same high standard: interruptions are for emergencies only! Have a classroom method for politely showing someone you have something to say. E.g. silently raise your hand, place your hand on the speaking person’s shoulder, etc. Enter the classroom quietly. When re-entering with the students, wait for all the children to be calm and ready before entering the classroom as a group. Provide lengthy periods of time for work to allow your students to enter and remain in concentration. Provide places for your students to work independently. Provide interesting activities and materials to engage your students. Observe your students to find what works best for each individual. Usually our rambunctious and disruptive students just need a positive outlet. Allow your students to struggle, to make mistakes, to learn how to work through problems independently. Be present and available so they can ask for help if they need it.